You may be surprised to learn that I can read foreign language genealogy records…in five languages, no less, despite the fact that I don’t know any foreign languages. How was I supposed to know back in the 1980s when I declined to take a foreign language elective in high school that it would come back to haunt me? It never occurred to me that beyond reading street signs and menu items I would need a foreign language. But then, genealogy happened. I’m going to tell you all about how I conquered this mountain and learned how to read foreign language records in the “How I Did It” writing challenge. All my ancestors arrived in America after 1840. This means I’m pond jumping on all lines by the mid-1800s. This means I need to know some Portuguese and French just to research my great great grandparents. Hawaii doesn’t let me off easy either. Early vital records are written in Hawaiian and Catholic Church records are written in Latin. Let’s not forget Dutch. Not my tree, my brother-in-law’s tree. Some of the early records I’ve looked at for Albany and Schenectady, New York are in Dutch. I was about two years into my genealogy research when I learned what villages my Azorean ancestors were from. I did what anyone in my situation would do. I panicked. You mean I have to learn Portuguese?!?!? Of course, I knew that the Azoreans spoke Portuguese. I mean, duh! But, the irrational side of my brain wasn’t having any of it. The whole idea of looking at the records intimidated the heck out of me. I waited a whole year before I ordered my first microfilm at the LDS Family History Center. How did I conquer my fear and learn to love foreign language records? 1. A Portuguese English Dictionary. I have the Oxford New Portuguese English dictionary and it has served me well. I got copies of a couple of documents. I copied them to lined paper leaving a gap between lines. With my dictionary, word list, and examples of transcribed records, I attempted to translate the documents word for word. I rewrote the transcription to give it context so that it made sense. This is one of my early attempts at transcribing baptismal records. There are mistakes here and there. I got better with practice. After I did a few records, I noticed that there isn’t a whole lot of variation in wording between records. There are only so many ways you can say “On the ___ day in the month of _____ eighteen hundred and eighty two, I baptized _____ daughter of ________”. This was my epiphany. I realized despite slight differences in wording, there was a pattern. Between villages, time periods, and writers there are differences, but mostly they stick to the same formula. I typed up my own fill in blanks form. I filled in the date of birth, date of baptismal, name of child, parents, and godparents, and witnesses. 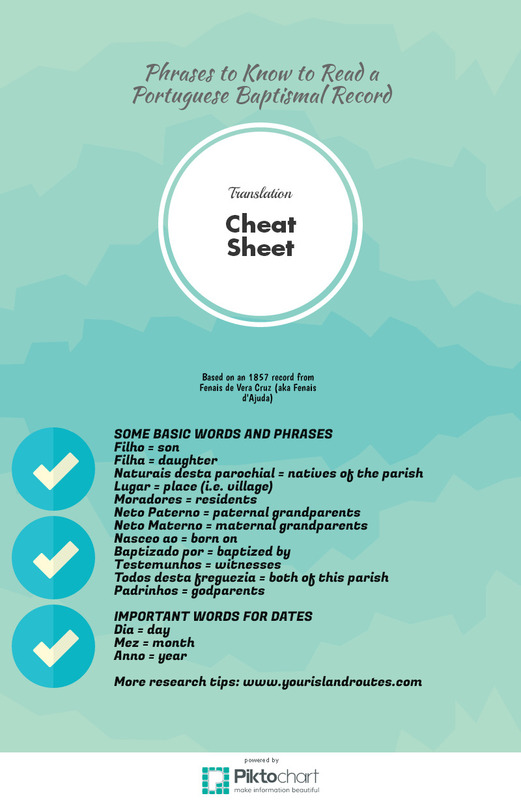 With this cheat sheet, I was able to train myself to look for the keywords and phrases and ignore the rest unless the record didn’t follow normal wording. That’s how I did it! How Does This Fit in with the Four Other Languages I Needed to Know? Funny thing about church and vital records. Not only is there very little variation between records in a village, there isn’t much variation between languages. After Portuguese, I worked with Hawaiian. Early registry books are written in Hawaiian. Learn the column headings and you can read the rest. Next, I was hit with Latin church records. Word roots were similar to Portuguese. My biggest problem was priests Latinized names. Sometimes they made them up as they went along. Dutch scared me. It seems like such a strange language. 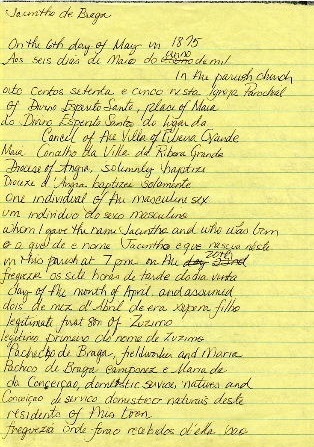 Very different from the Portuguese and Latin church records I was working with. Yet, it wasn’t. The basics of the record structure stayed the same. Learn the basic words and phrases and you can find the details you’re searching for. About 15 Years after I first sat before a microfilm reader looking at Portuguese records and writing with a shaky, nervous hand, the French records went online. I told you I don’t know French, right? Church and civil records don’t differ much. Word lists and dictionaries help us figured out the important words. The more you translate records the better you get at it. Remember all those Latin word roots you memorized in high school? It’s finally going to pay off. Or, a fairly good facsimile. By working with Portuguese and Latin records, I could read the French records. Different language, but similar word roots and very little difference in how the church records were worded. I’ve come across many researchers over the years who stop researching once they hit the end of US records. First, they seemed disappointed that the rest of world writes in their own language or that no one has bothered to pre-translate all those records into English. Second, they convince themselves that they can’t read foreign records because they don’t know the language. Look at me! High school graduate with no experience with any foreign language outside learning the Spanish words for body parts in 6th grade and Latin roots in high school English. Oh, sure, my siblings and I spoke OP, but that’s not exactly transferable to the real world. Yet, not only can I read one language, I can read 5. You can’t expect the words to just fall off the page into your head. And, you can’t expect foreign records to be in English. Just like working with word puzzles, you have to work with the records and figure out their secret code. Start with the easy ones. Baptismal records are shorter and don’t have as many exceptions as marriage records. Read them and get familiar with the words. Translate records line by line until you understand which words and phrases are important. Create a line by line fill in the blanks cheat sheet. Use it to get better at keying into the pertinent phrases. Create an “important phrases” cheat sheet that follows the wording of the records you are working with. Don’t forget to use the available aids! A good two language dictionary and a word list will help you get through the records. 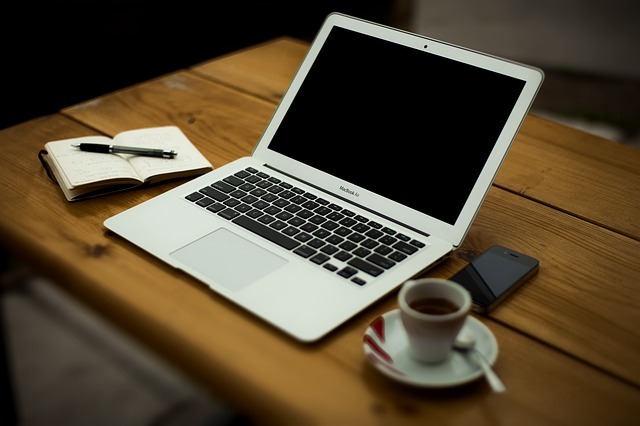 You can use online translators, too. I am partial to reverso.com. But, remember, context sometimes get lost especially when working with records written in another era. Don’t rely on them exclusively. (To find more word lists at FamilySearch.org, from the main page of the website click on Search, select Wiki, then search for the term “word list” without quotes). Cheri Mello’s Finding Your Roots contains several transcribed records. This is a PDF file. You will need Adobe Acrobat to open it. Now go out there and conquer those foreign language records! If you’ve learned to read foreign language records, tell us about it in the comments. Share your tips with our readers. The How I Did It challenge was created by Elizabeth O’Neal for the 2nd Annual Genealogy Blog Potluck Picnic. Thank you, Elizabeth, for this challenge! Loved your article! I have several letters written by my German ancestors. The three I was most interested in, however, were written by a 15-year-old cousin to my great grandmother, all dated circa 1905. I was determined to learn what these letters said! By using a combination of a German to English/English to German dictionary, Google translate, and online examples of German handwriting, I have been able to transcribe the first one and am half way through the second. The letters are completely fascinating and I really had fun with the challenge. It was a lot of work but so worth it! Lark, Translating letters takes is much more challenging than documents. You can find the words, but then there is the context to consider. My French relatives left behind some letters. We were fortunate that a French cousin offered to translate them. I bet it was very rewarding for you though. There is something special about reading your ancestor’s letters! I’m lucky enough to be able to make my way through Romance languages with some basic knowledge of Latin, but I was lost in the Scandinavian and Slovak languages. It really isn’t as difficult as one would imagine figuring out what foreign language records say. Great tip for others who might shy away from researching their family because of perceived language barriers. Linda, The whole idea is intimidating, isn’t it? I like to treat translating like word puzzles, maybe cryptograms. Figure out the key and you can figure out the record. You have so many good ideas and great patience. You are so right that certain kinds of documents follow a formula. A cheat sheet is a great aid. Andrea, I think sometimes we make mountains out of molehills. Translating records when you don’t know the language can be scary. Lucky genealogist have a ton of tenacity. Great post, Melody, with some excellent suggestions for translating foreign documents. 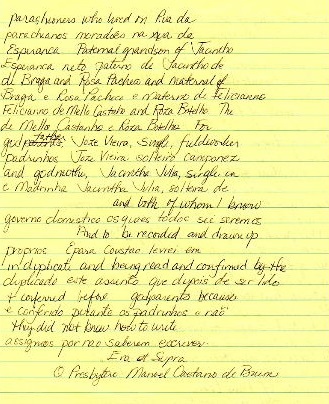 I especially like the idea of copying the documents with space between lines to write in the translation. Others will not go wrong by trying your method. My challenge was German written in some of the early Germanic alphabets. The letters are different than the English alphabet and the words were German, of course, so it was double-duty for translating those records. Nancy, Thank you! I found if I approached translation like code breaking it was much more fun to work with. It would be much more challenging having to work with a different alphabet, though. You’d first have to learn those new letters, plus if they are older records, you have to get used to the handwriting style as well. I’m confounded in older records with how they abbreviated names. It doesn’t make translating any easier! 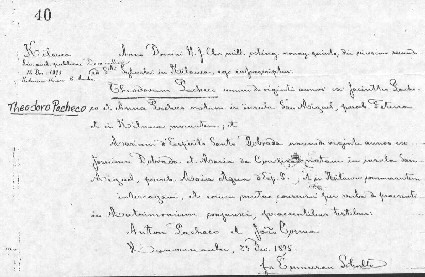 I am French and research all over the French Archives on line from the U.S, but I still have fits with certain records and I wish you luck on those: Records written after the French revolution by people who barely had any education, records written by that old, old priest who just finished his 69th year in the same parish and whose writing is a series of ink blobs…..!. However I am applying your same system to finding my Italian ancestors, because you are right, all acts follow a certain protocol. I also can tell my latin has improved drastically since I am searching in church records in Belgium. The key to me was to just turn the pages of the register and read all the acts one by one and get familiar with the priest’s handwriting and the people in the village. I also found many relatives and collaterals of my main ancestors that way. Win-Win! But this all works up to a certain period. Before that the letters are very different and one must really get into paleography to even start to understand the letters, let alone the words. Annick, Familiarity with the priest’s writing is very important! Once you get their style down, it makes reading the records much easier. This is where practice is a big advantage. I agree wholeheartedly that the further back you go, the more difficult it gets. Styles of writing are very different and the use of abbreviations can make it really difficult to understand records. I find the abbreviations very confusing. I guess they needed to preserve paper and ink. Thanks for your comments! It’s nice to meet someone else working with French records and genealogy. Teresa, Both those languages sound like they’d be very challenging to work with! I admit that I still have trouble with numbers. Spelling out the dates makes it more confusing. My first foray into foreign records were German. The FamilySearch word lists were a wonderful help. Then I did Swedish records. Luckily the book “Your Swedish Roots” was most helpful, written by the same people who put up Genline, which I was using at the time. When I started with French Canadian records, I found a blog post at “MapleStarsandStripes.com” that dissected a French Canadian baptism record. There are lots of resources out there to help us! Lisa, It is great that you found so many resources to help you with the three languages! If we can find the right tools and tips, we can learn to read these records. Lightbulb! Why didn’t I think of doing this? This is a wonderful article, great help, and truly inspiring idea. If research is a favorite thing for you to do, this plan will make it even more enjoyable. Somebody mentioned it was like code breaking, and that’s right. Genealogists are all code breakers, detectives, and puzzle solvers anyway. Thank you so much for this Melody Lassalle. Roberta, You’re welcome! Genealogy and translating is a lot more fun if you see it as a puzzle that has to be solved.